Here is an internal Harper's Bazaar document that lists the brands to feature in upcoming editorial spreads, ranked according to priority — and helpfully divided between "Advertisers" and "Non-Advertisers." This is how your ladymag sausage gets made. 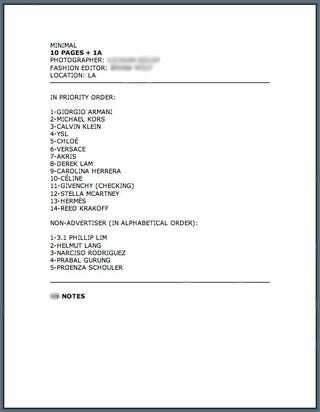 A careless staffer left this brand list (click to enlarge), along with call sheets for three shoots, on the desktop of an L.A. hotel's public computer, where a Racked tipster found it. It's not exactly a shocker that ladymags are in thrall of their advertisers — remember the Marie Claire "editorial" that was comprised only of clothes from Ralph Lauren, Ralph Lauren, and Ralph Lauren? — but it is rare that concrete proof of these relationships emerges. Everyone knows that editors, especially editors at fashion magazines, take into account the views of advertisers when planning their editorial content. But a list of 14 advertisers to include, vetted by Harper's Bazaar editor-in-chief Glenda Bailey, ranked by their respective ad buys, shows precisely to what extent fashion magazines (which are largely coextensive with women's magazines) have allowed their editorial judgment to be corrupted by the luxury brands that shower them with advertising money. So: this spring, look out for Harper's Bazaar spreads featuring Giorgio Armani, Michael Kors, Calvin Klein, Yves Saint Laurent, Chloé, Versace, Akris, Derek Lam, Carolina Herrera, Céline, Stella McCartney, Hermès, and Reed Krakoff. (Givenchy might be there, too — once someone is doing "checking" their advertising money merits inclusion.) Not because the editors of that magazine necessarily think those brands have the most beautiful, most interesting, or well-designed garments and accessories, but because those companies are the biggest spenders.